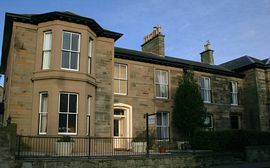 The Hollies bed and breakfast is an elegant Victorian house, located 10 mins walk from Glasgow/Prestwick Airport and 2 mins walk from Prestwick train station. The house has been lovingly modernised retaining many original Victorian features. 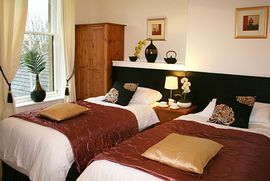 Our rooms are simple and elegant with ensuite facilities, Welcome trays with tea & coffee, radio/alarms, TV, Wi-Fi and internet access, and Off- road parking. 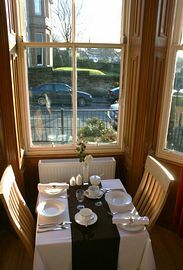 The house has a fascinating hertiage with strong connections to Charles Rennie Mackintosh, as well as being an excellent base to explore the rich cultural heritage of Ayrshire - Culzean Castle and Burns Heritage Trail- and its coastline. For the golfer, we are just 2 mins. walk away from Prestwick Old Course - the birthplace of the Bristish Open Golf Championship - and minutes away from many other spectular golf courses, such as Royal Troon, Lochgreen, St Nicholas, and Turnberry, to name a few. Tee-off times can be arranged upon request. For families, we are just minutes from a beautiful sandy beach with views towards the isle of Arran and an indoor activity centre for children. Just 15 minutes drive away we have Loudoun Theme Park and Heads of Ayr Farm Experience, plus many wonderful castles to explore and discover. We make every effect to ensure your stay with us is relaxed and comfortable, from offering travel advice locally or nationally, too recommending local places to eat and drink. Holidays are special times, and we want your holiday with us to be a memorable one. Within walking distance of Glasgow Prestwick airport and Prestwick town train station. Within walking distance of Prestwick's many bars & restaurants. Special Diets Provision: Special diets are catered for. On request, prior to arrival. From Prestwick airport, take the 3rd exit to Prestwick town at the roundabout. At the 1st set of traffic lights turn right. The Hollies is 10 mtrs down on your right. From Glasgow or Ayr, get off at Prestwick town station. Head up towards the town centre, away from the beach and The Hollies to 50 mtrs from the train station on left. 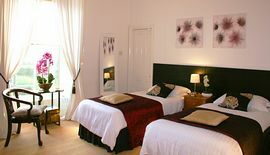 Price from £27.50 to £35.00 per person per night including breakfast.